Our general plan is to fly into Tokyo, spend a few days there, then take the train to Kyoto and see the sights there as well. After that, we're planning on renting a car so we can explore some of the less "touristy" parts of the country. I have been to Tokyo myself several times and am familiar with the area. In addition, I am somewhat functional in Japanese so being out of the cities in areas where English may not be spoken won't be an issue. Please feel free to share any thoughts, recommendations, and experiences you have that to help us plan a memorable trip. I'll be traveling to Japan in mid-December and will have three spare days and my camera gear with me in Tokyo. I'm planning on shooting some of the iconic scenes (should be a crossing, Rainbow Bridge fireworks, Meiji Shrine , etc.) - any recommendations for other "shot worthy" locations I may not know about otherwise ? I started out with a D3300 and the 18-55mm and 55-200 kit lenses. Last year I upgraded to the D7200 (which I absolutely love) and my wife began shooting with the D3300 and the two kit lenses. My primary lens currently is the Nikon 18-140mm (a great lens which is on my camera 90% of the time), a Tamron 70-300mm, and a Sigma 10-20mm which I use as the situation calls for. We were on a whale-watching ship last weekend, and my wife was commenting that her pictures didn't seem nearly as sharp as mine were. 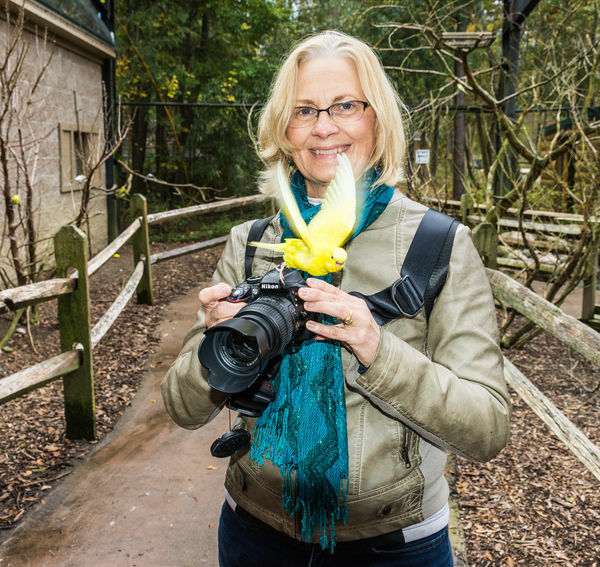 I invited her to use my 18-140mm on her D3300 while I had the 70-300 on the D7200. Not surprisingly, she got better results than she was with the 55-200mm kit lens. So now we're looking for a mid-range zoom she can use that would be of similar quality to the Nikon 18-140mm but would complement it in terms of speed or macro capabilities since we'd prefer not to have two identical lenses in our collection. 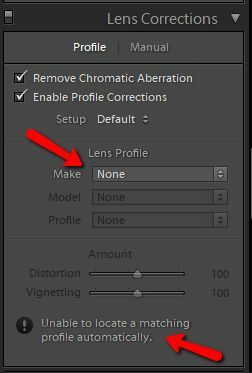 Whenever I import files into Lightroom, I have it set to apply Lens Correction, and this has worked correctly for all my Nikkor and Tamron lenses over the years. I recently bought the Tokina 11-16 f/2 DX II for Nikon and noticed that when I view the raw images in the Develop mode, the Lens Profile is set to "None." (Attachment #1) When I select "Tokina" as the Make, LR instantly selects the correct lens. (Attachment #2) This is an "officially" supported lens, and it's in the list once I specify Tokina; it just doesn't seem to match the profile to the imported images automatically. 1. Has anyone else experienced the same problem with this lens or with another supported lens? 2. Are there any settings I need to adjust to correct this? 3. 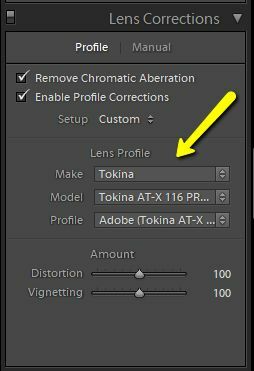 If not, is there a way to "force" LR to use the correct Tokina profile when it sees the information it has for the lens in the EXIF data on import? Is it me, the body, the lens or the combination??? +1 on the Steve Perry book - it's very detailed and will take some time to read and process everything, but definitely worth the time and effort. Greetings! I upgraded last September from a D3300 to the D7200, which I absolutely love. My wife now uses the D3300, and my main setup is the D7200 body with the Nikon 18-140mm lens and a Tamron 70-300 lens. I'm going to be doing some interior real-estate shooting in the next few months and would like some recommendations on a good super-wide-angle lens to use with these cameras. 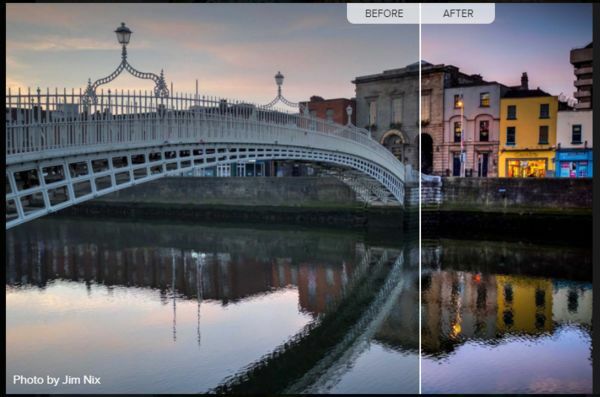 Lightroom 6 - "Slider" on Before & After View? In Lightroom 6, there are several options for seeing the "before and after" view of a developed photo, but is there any way to have a "slider" on the image so you can "wipe" to the left or right to see more of one side (see attachment) instead of just having the image displayed "half and half?" Steve, just wondering about the 12-bit suggestion - is this because the lower quality of the images above ISO 400 negates the benefit of 14-bit images? Thanks! I bought my D7200 in September from Cameta and it had just 240 shutter actuations. It looked just like new, and has worked perfectly. That said, I know some people have received refurbs with several thousand shutter clicks, so for $50 more, I would go with the new unit. Thanks, Steve. I've enjoyed both of your E-Books. Since you seem to be on top of all of this, any idea if/when Nikon will have a firmware update to include this feature? And is this even an issue for landscape photos or am I just overthinking this? I have a D7200 with what I believe is the current firmware version (1.02). We just got the Nikon AF-P DX NIKKOR 10-20mm f/4.5-5.6G VR lens which does not have a switch to turn on/off the VR capabilities of the lens. On my wife's D3300, there is an "Optical VR" option in the photo SHOOTING MENU, but I can't find anything similar in my D7200 menus. 1. Does this option exist on the D7200 and I'm just looking in the wrong place? 2. If I can't turn off VR, how will this impact my images when I'm shooting on a tripod? I recently got a refurbished D7200 with just 400 shutter clicks. I calibrated my 18-140 lens before traveling to Italy where we took about 3,000 pictures. This weekend, we went out for some landscape shots, and the focus seemed to be a bit off. Is the AF Fine Tune calibration something that needs to be done periodically, especially since the refurb body was relatively new? We recently went to a bird sanctuary and got lots of great shots. I was wondering when you're using a tripod if it's better to compose the pictures using the viewfinder or with the live view on the LCD display. My daughter got me a D3300 about two years ago as a present. Now my wife is interested in starting to shoot some photos and she invited me to upgrade my camera. and she'll take the D3300. I've ordered a refurbished D7200 body from Cameta (arrived in two days, and has a one-year warranty, so a big +1 on the "ABC" vendor recommendations) and so I now need a mid-range zoom to add to the glass collection so we can both shoot similar images when we have to. I currently have the 18-55mm and 55-200mm VR kit lenses that came with the D3300, and a Tamron AF 70-300mm f/4.0-5.6 SP Di VC USD XLD for shots that need the extra reach. With the Tamron, it took three tries to get a copy that delivered the results people had enthusiastically claimed in their reviews, but the one I have now is fantastic. After a bit of research, I decided to try the Tamron AF 18-200mm F/3.5-6.3 Di-II VC for $199 US. The results so far have been a bit disappointing, with soft images throughout the range. I realize that "super zooms" like this won't deliver the tack-sharp focus of shorter-range zooms or prime lenses, and this situation may indicate another Tamron quality-control issue that will require a few exchanges to get a good copy. 1. Can anyone speak to the general quality of the Tamron 18-200 so I'll know if I should try exchanging the lens or just return it? 2. What recommendations would you have as an alternative for a reasonable-quality walk-around lens? I'd like something that starts around 18mm at the low end and goes up to 120-200mm at the long end of the range - I don't necessarily need to go up all the way to 200 since that's already covered with the 55-200 Nikon and the 70-300 Tamron. 3. I know the lens will work with both the D3300 and D7200, but should I expect to see any variation in focus accuracy when swapping the lenses between the two bodies? Thanks, as always, for your valuable input! Upgrading from D3300 - Would you recommend the D7500 or D7200? New or Refurbished? Thanks for your reply - I appreciate it!